Wythenshawe Community Housing Group (WCHG) are honoured to announce they have scooped the hat trick being awarded three prestigious accreditations for ‘Investors In People Platinum’ status, ‘IIP Health & Wellbeing’ and ‘Top Employers 2019’, being the only housing association in England to achieve this. This places WCHG in the 0.5% of leading organisations not only nationally but on a global scale in 75 countries. 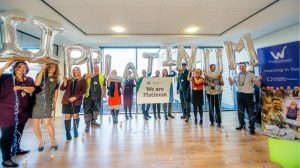 We are proud to be joining an elite group of world class organisations across all sectors and to be the very first Housing Association in the North West of England to achieve IIP Platinum status, which puts the spotlight on our exemplary approach to developing, supporting and leading people effectively to achieve sustainable results. ‘Investors in People’ is the international standard for people management, defining what it takes to lead, support and manage people effectively to achieve sustainable results. Underpinning the Standard is the Investors in People framework, reflecting the latest workplace trends, essential skills and effective structures required to outperform in any industry. Platinum status is the highest level of ‘Investors in People’ that an organisation can achieve. WCHG were also named as a global leader in people management practice, having been awarded Excellence in Health and Wellbeing. The Health & Wellbeing accreditation is an international accolade across all industries, which recognises pioneering employee health and wellbeing working practices. WCHG believes that good wellbeing is good business, and will continue to drive excellence in its working practices and will keep employees at the heart of this to be the driving force. 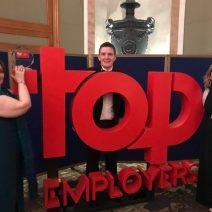 The rounding up of the hat trick was achieved when it was announced on the 31st January, that WCHG had been officially recognised by the Top Employers Institute as a Top Employer UK 2019 for excellence in employee conditions. The HR Best Practice Survey encompasses over 100 questions which cover 600 ‘People Development’ practices across 10 topics: Talent Strategy, Workforce Planning, Talent Acquisition, On-boarding, Learning & Development, Performance Management, Leadership Development, Career & Succession Management, Compensation & Benefits and Culture. The Top Employers Institute evaluates the implementation of these HR practices and reviews how they are supported through Strategy, Ownership, Practices, Measurement and Technology. Interim Group Chief Executive, Kevin Lowry said, “This is an outstanding achievement and is a true testament to the culture, forward thinking and innovative approach of the organisation and is dedicated to all the hard work and commitment of our colleagues. I would personally like to thank everyone for the amazing work they do every day. This is a reflection of our ongoing commitment to making WCHG a great place to work where individuals can realise their potential and attain their career dreams. We believe that people make the difference and by investing in them we are looking to create a sustainable success and a lasting legacy for the Wythenshawe Area. We see learning and development as a key driver of our long-term competitiveness, as well as collaboration and innovation”. Chair of the WCHG Board, The Bishop of Manchester, The Right Revd Dr David Walker said, “It’s people who make a community, and at Wythenshawe Community Housing Group people come first, whether they are our tenants and residents or our staff. These three achievements are a great encouragement for us, and a tremendous vote of thanks to all who worked to help us become a triple award winning organisation. They are not an excuse to rest on our laurels. The recognition they bring will encourage us to strive to be better than ever, for the benefit of everyone who lives or works in Wythenshawe”.